It’s been almost four years since we decided to embark on this quest to build a mortgage free homestead. We spent a lot of time in the beginning deciding where we wanted to live, and how we wanted to build. We looked at tons of house plans, bought a set, and drew up our own using a very basic computer program. originally purchased. What usually happens, is we pull out the plans and start talking about how we will live in the house. I look for the spots for furniture, and think about where we will put stuff and where we will have a dinner party for 8 and then I say. “It’s too small.” Then we go to a bigger plan and realize it will cost $80,000 to build, and we go back to the small plan. the cycle. Ahhh! He was right. We picked the right plan 3 years ago, but we had to go through the cycle (10 times!?) to be sure it was the right plan. On Memorial Day, we made the once-and-for-all (I promise, Karl.) final decision on how we will build our small house. The first phase of this project is a 16′ x 24′ building. I’ll share details soon. Karl’s focus went straight to drawing up a master materials list which meant we had to decide on the size and placement of the windows. It seems like it should be a simple thing to do, but For me, everything is interconnected. Window size affects wall space and wall space determines furniture placement and shelf space. In order to make good decisions, we did a scale sketch of the space and drew in a couch, small dining table and a spot near the door to take off shoes and hang backpacks. We talked about how tall the back of the couch will be and where the windows should start, how big the window over the table should be to allow for shelving to store dishes, etc.—we tried to imagine how it will feel to move around in the space. We started with the biggest possible windows, but then decreased their size a bit to allow for shelves in each corner, and a four-foot shoe bench with cubbies for our bags. I think we struck a nice balance between wall space and light—-allowing a lot of natural light to flood the house. Large windows to see the woods and garden will connect us to the outdoors. We are doubling our house size, so we will definitely feel a lot more breathing room. We have planned it so we can add wings on either side when we save up another chunk of money. Knowing there is a plan for growth (if we need it) gives me peace of mind. And, yes, there will be a bathtub!! Wise man says….plan your work and work your plan. Rock on! Sounds great, can’t wait to see your drawings. Maybe your “add on wings” plan will work for my family too! Hi, Michelle! It’s a great way to build as you grow! It’s the way it used to be way back when. Good common sense, no? Thanks for reading! Have a great weekend! We’ll be there with y’all every step of the way! Hey, Andrew! Thanks!! We enjoy following your journey, too. Love your “cash on the barrel” phrase. Have a great weekend. Wonderful post and I cannot wait to see what your plans are. My husband and I have similar back and forth discussions about plans and it seems that if I plan on my dinner parties I end up with way too much house. My family comes and visits every weekend so we usually have at least 12 on the weekends.When I think about this I usually end up looking at plans that are way too expensive and way too much house! 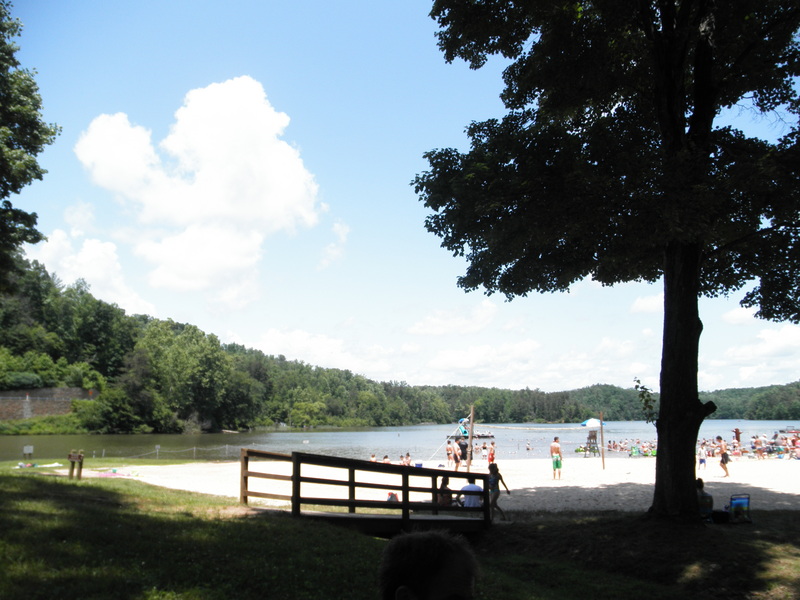 BUT I think back to when we are vacationing and all seem to fit very nicely in a 16 x 12 foot space (the area of the main area – excluding a small bedroom and bathroom). Finding that just right amount of space can be tricky 🙂 We are so happy we get to read about your journey. Happy summer vacation! Similar to your vacation experience, we measured our friend, Veronica’s, great room during a potluck of 8 adults and realized the space was the same dimension we are building. Feeling that real space at a potluck of 8 (which was a blast!) meant we can have a nice, intimate dinner party. You are right–we would build too much house if we built around the need to entertain large amounts of people. Everyone usually congregates together anyway. I so appreciate you following our journey and am glad you enjoy it. Thanks for your insights. I enjoy reading them. You guys are such an inspiration! Thanks! Hi Macy! Thanks for reading. Your sweet comment makes me happy. Best!! I think all of the planning and discussion of space utilization will really payoff for you guys. Don’t know how designers do it now (or at all) but I know the houses built out here in the last 20 years are full of waste and useless space. Yup! Then we have to pay for it, clean it, heat it, cool it, furnish it, fill it up with stuff. . . Small is beautiful! Thanks for reading and contributing your ideas, Donna. Can I do a post on you? May I ‘borrow’ some of your insight? I will always direct attention to you and your blog. Hi Debra! I am glad we have each other, too! Sure, you can borrow some of my insight. What a compliment. Thanks. I look forward to reading it! Have a great week!! I think that what you’re doing is great! I would love for us to be able to have our own land and tiny house. I want to get out of town and into the country. Houston(TX) is getting far too close to our little town. Land costs here are unreal with six-figure price tags. We’re trying to figure out how to save to get out when we’re doing all we can just to survive, all the while paying someone else’s mortgage because we’re renting. Hi Suzanne! It is a challenge, for sure. Our process required a complete shift in the way we think and live. Start small. My first step was hanging a clothesline and making my own detergent. Every little bit helps. And keep track of every penny you spend. It’s a great and adventurous challenge! Good luck. You can do it! I wish more people would downside and life would be so much better. There would be less stress for many and enjoy life to the fullest. Life is too short to be in rolls of debt. I pray God will truly bless your family and continue to enjoy life. Much success in the second phase of building your house. Thank you, Carol! Life is much better for us after our big downsize. Thanks for the blessings. Blessing to you. . .
I’m going to join to choir and say that you’re awesome! Not only that but you’re teaching your children so much by your efforts. Blessings! I appreciate you taking the time to join the choir. Such a nice feeling to be appreciated. Best! 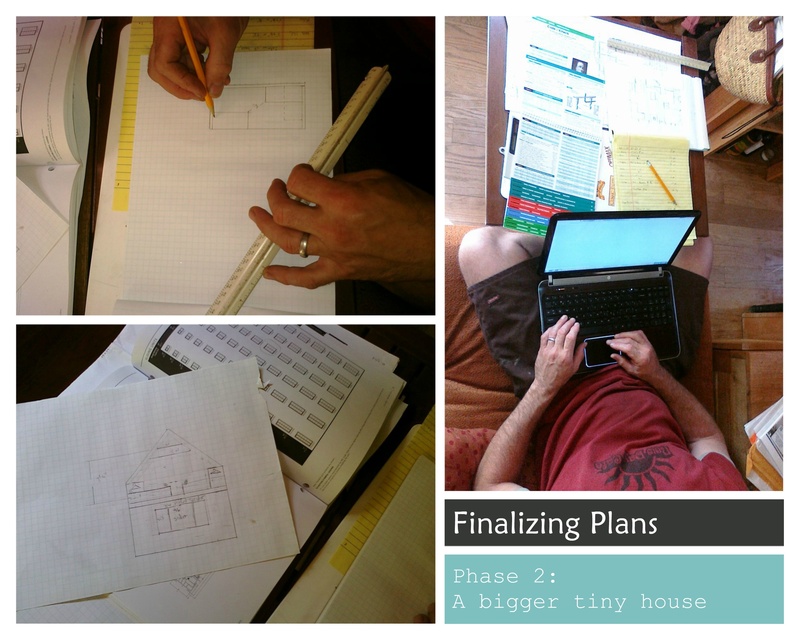 Been talking about doing this all for years — have my own 16×24 plans. One thing I noticed about the drawings of your new place: it doesn’t have a gable roof. This would really give you a LOT more room for not too much more money at all. Just a thought! Blessings to you all. Thanks, DM. We used a gable roof in the tiny house for that reason. Thanks for pointing that out. We’ll add it to our conversations. Blessings to you. Im totally moved by your story! Like you once did, my family currently lives in Florida in a 1,500sq foot 3 bedroom home. We feel blessed that we still have our jobs, unlike many who are struggling in this economy, and we are even striving to change our careers. Ive always dreamt about simplifying our lives and getting back to a more peaceful, healthy way of living. I love and admire what you guys are doing and think you guys are great role models to those of us who have fallen victim to the social standards of this backwards thinking society. Its definitely not about the fancy expensive cars or fancy expensive material goods. Its the peace of mind that you get from having your family together and being able to call wherever you are home! Many blessing to you and your family. All the best! Thanks, Alex. Peace of mind is what we strive for. It’s nice to know our story causes this type of thought. Thanks so much for reading and leaving your thoughts! Best! Good planning, great execution. And have a happy birthday! Thanks, Richard! It was a great birthday. More celebrating to come! This is so inspiring! Me and my family (4 of us total) are starting our tiny house project now. We’ve got the land (1.24 acres) and though it’s not much it’s all undeveloped around us and we’re able to pay for it in a matter of months. We’re working with code now, they don’t seem to believe we can build a home for less than 20,000 dollars (silly man). I’m working on getting a materials list together and have been scouring craigslist. Just a question, did your family think you were nuts? Parents etc? My mother keeps trying to tell me I need to just move into an apartment and build later. I think she’s just old fashioned… I look forward to seeing your progress! What plans did you start with? We’re using a “homesteader cabin” and modifying it for two lofts… Keep up the fantastic work and can’t wait to see your progress! Our friends and family lovingly thought we were nuts a long time ago 🙂 But, yes, when we got the exterior of the tiny house sheathed, we had a party and gave tours explaining where everything would be. There were a lot of wide eyes and “How are you going to live in there?” comments. There are certainly still family members who say there’s no way they could do it, but as we build our little homestead piece by piece we are showing the skeptics that it can be done and done with joy. If you can build now, think of all the rent you’ll save! Go for it!! Tiny house families unite! HI! Cool Story and Journey! We built a few years ago bigger than what you are planning but did a few scale model workups to help with flow and sight lines. Pretty easy to do: go find a big piece of cardboard (refrigerator box) decide your scale 1′ of your to be built wall equals 3″ or X” of cardboard. Get an exacto knife and start modeling. We built wall sections to see what it looks like. Get really crazy and you can do the whole house and you will have a replica doll house for the kids. I just found your blog and I am so excited. 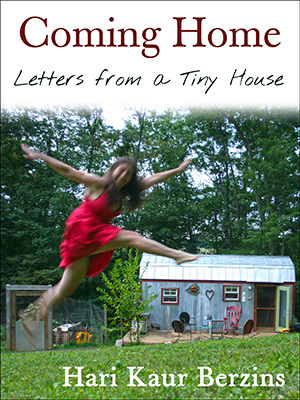 I think that it is great to read about a Tiny Home with a family. 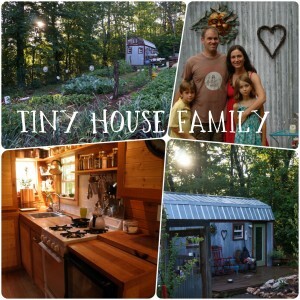 I want to do a Tiny Home, little more difficult for we have 7 in the family, but this blog is inspiring. Thank you so much!! Hi Becky! Welcome :). We are really settling into the lifestyle, and it is very fulfilling. Good luck to you! I’m sure you’ll figure out the just-right-sized house for your family! Best!! We are in the process of selling our much too big home to go small and mortgage free. I took my 5 children traveling in a camper trailer for several months a couple years ago and loved every minute of it. I want that again! Only I want it on our own land with a garden, a cow and some chickens and not in a camp ground. I’m so happy for your family. Thank you for being an inspiration to others.